Actress Bonnie Franklin, perhaps best known for her starring TV role as divorced mother Ann Romano in "One Day at a Time", has died (see the Los Angeles Times obituary at http://lat.ms/Zi8oZk). She passed away on Friday, March 1, 2013 at her Los Angeles home from complications of pancreatic cancer at age 69. News broke in September that Ms. Franklin had been diagnosed with pancreatic cancer. She was surrounded by family and friends at the time of her death, an individual familiar with the situation said. A private memorial will be held in L.A. this week. In lieu of flowers, her family suggested donations to CCAP, a nonprofit organization that was started by Bonnie Franklin and her sister Judy Bush to introduce and implement great American Plays into inner city schools' curriculum. Bonnie Franklin was born in Santa Monica, California in 1944, and she first appeared on TV at age nine, in "The Colgate Comedy Hour," and made her Broadway debut in 1970 in the play "Applause." She also had a semi-regular role on ABC's "Gidget" with Sally Field. However, Ms. Frankin became a household name back in the 1970s thanks to her TV role of Ann Romano, who was a recently-divorced, working mother trying to raise two teenaged daughters on her own. That show ran on CBS for nine seasons. After "One Day at a Time" ended, Ms. Franklin had largely stayed out of the public spotlight (although she appeared in a number of plays in Los Angeles) until returning to TV in various guest roles quite recently. Perhaps most notably, she appeared as a guest on the hit TV Land first-run TV show "Hot In Cleveland" as the Polish mother of a man (who was played by actor John Schneider) that one of the show's core characters Melanie Moretti was romantically interested in. Of course, the character of Melanie on "Hot in Cleveland" is played by Valerie Bertinelli, who famously portrayed Barbara for "One Day at a Time's" entire duration, as one of Ann Romano's two daughters on (the other was played by Mackenzie Philips, although that character was on-again, off-again, on-again due to Ms. Phillips own substance abuse problems in real life) back in the seventies. In fact, Ms. Phillips was fired twice from the show. Aside from her brief appearance on "Hot in Cleveland" during Season 2, Bonnie Franklin was also honored at the TV Land Awards in 2012 (see http://bit.ly/15s3jFs for a clip) along with Ms. Bertinelli, Ms. Philips and Pat Harrington, who played the building supervisor in the "One Day at a Time" series, and the cast also reappeared together in a 2008 cast reunion on NBC's Today Show, which I'm sharing here. That clip, which was part of a week-long series called "TV's Greatest Casts Reunited" which I've featured here in the past, aired on February 26, 2008, and a page for that can be seen at http://www.today.com/id/23350209/ns/today-entertainment/t/cast-one-day-time-reunites-today/ and a video (for the time being, anyway) can also be seen there. The show received an Innovator Award from TV Land (see http://bit.ly/2cGvkCB for details). "One Day at a Time" was very much a product of its time. The show was created by TV legend Norman Lear, but in some ways reflected what an entire generation of kids of the day were experiencing. Gen X was perhaps best defined as a generation of divorce victims (for lack of a better description, although that helped shape the generation to be self-dependent), and the prevalence of latch-key kids whose parents were divorced were very much reflected in that show. The show was also among Norman Lear's longest-running shows, having run for nearly a decade on CBS from 1975 to 1984. In spite of its now unheard of duration in prime-time, so far, only the first season of "One Day at a Time" has been released on DVD (or for that matter, has been digitized). 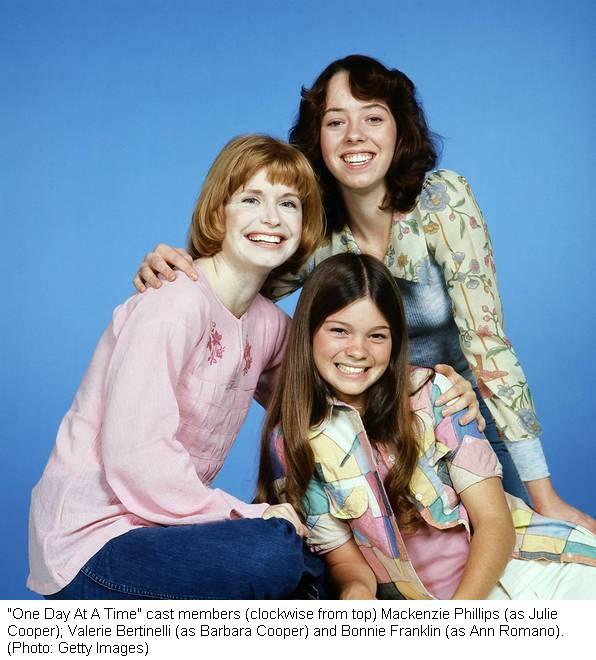 At present, neither TV Land, nor any of the newer networks that have followed in its footsteps such as Antenna TV, Me-TV or RTV (Retro Television) are airing "One Day at a Time" right now, although that could change. Ms. Franklin's early death at age 69 from Pancreatic Cancer was quite young, but there are almost no effective treatments for pancreatic cancer. "My heart is breaking. Bonnie has always been one of the most important women in my life and was a second mother to me. The years on One Day at a Time were some of the happiest of my life, and along with Pat (Harrington Jr.) and Mackenzie we were a family in every way. She taught me how to navigate this business and life itself with grace and humor, and to always be true to yourself. I will miss her terribly." "I am so saddened by the loss of our dear friend, Bonnie Franklin. She was just full of light and love. Bonnie will be very much missed by all the people she touched with her love. Family, friends and fans. Please respect the privacy of her wonderful family at this difficult time. We all loved her very much." While its not quite the kind of cast reunion post I envisioned for "One Day at a Time", it seems appropriate to acknowledge the loss this way. Author P.S., January 7, 2016: Pat Harrington, Jr., best known for his role as as Dwayne Schneider on television's "One Day at a Time", which was a Norman Lear sitcom that aired starting in 1975 that ran for nine seasons that sealed his image in the public's mind as the obnoxious super with a heart. He died in Los Angeles on January 6, 2016. He was 86 and suffered from Alzheimer's disease and complications from a fall. While his role as Schneider was his best-known role, his TV appearances read like a history of the medium: "The Steve Allen Show," "Make Room for Daddy," "The Jackie Gleason Show," "Marcus Welby, M.D.," "The Partridge Family," "Love American Style" — all the way up to "Curb Your Enthusiasm." An obituary appears in the Los Angeles Times at http://lat.ms/1JBRTUj and is perhaps the best place to view it. Author P.S., February 2, 2017: While movie and TV reboots occasionally emerge, and covers of popular music are routine, not all succeed. Sometimes, the reboot alienates the original TV show viewers and/or fails to connect with newer audiences. One example was the ill-fated 2007 NBC reboot of the 1970's TV series "The Bionic Woman" which was canceled shortly after it began because of low ratings. That said, having someone from the original series can help translate a reboot while keeping important elements that made an original successful. One such reboot is the 2017 TV series "One Day at a Time" which now runs on Netflix, and has been re-imagined with a family at the show's center being Cuban-American. APM's Marketplace radio interviewed the 1970's creator Norman Lear about the new version and his new collaboration with Gloria Calderon Kellett and Mike Royce. Listen below, or by visiting http://bit.ly/2jLMApo.